Next-generation basketball stars drew a crowd of next-generation fans at Samsung’s NBA Summer League series. The Summer League series expanded across Orlando, Utah, and Vegas. Attendance at the Vegas event was at a record-setting 108,891 this year. Since the launch of the series, more attention was placed on spectator experience. Las Vegas Events President, Pat Christenson said, “It was just an event that was there for GMs and the coaches to evaluate their players. 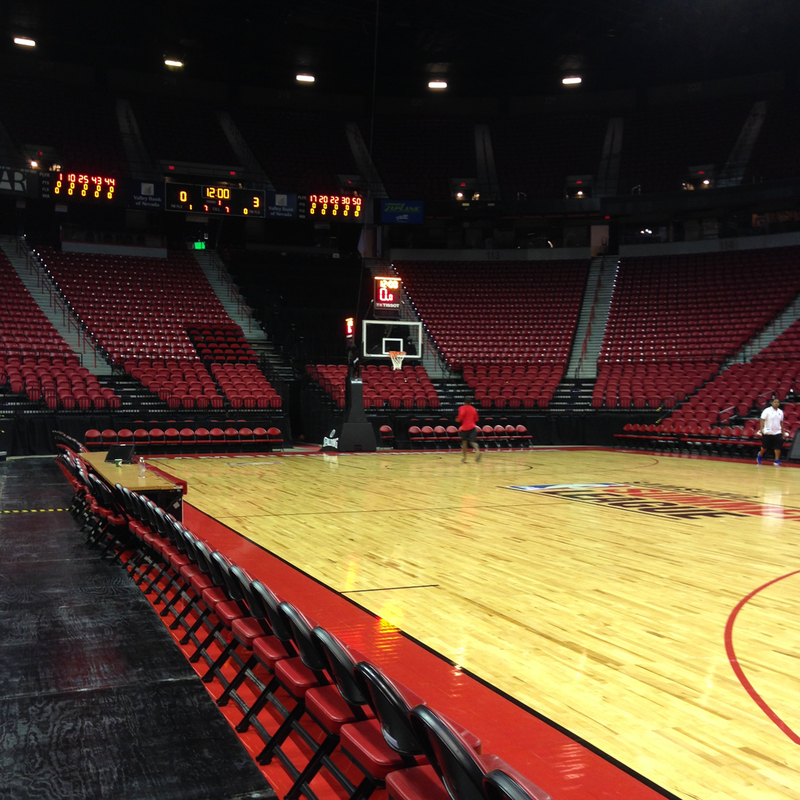 When [the NBA] approached us, it was with this idea of taking it to a different level.” The Vegas tournament now spans 11 days and brings swarms of fans to the city. Originally decorated with sticker banners wraps on columns, the Thomas Mack Center was to be transformed with interactive content and displays. “We started talking about what we could do with digital signage and interactivity and came up with a plan for a video wall that would allow access to highlights from previous years’ events,” said Mike Sisco, CEO of EMBED DIGITAL. The large-format display video wall was positioned at entrance where attendees were funneled through to enter the stadium. A Samsung 22″ screen was used as a remote for video wall content and was positioned 6–7″ away from a Samsung 4k resolution video wall system. 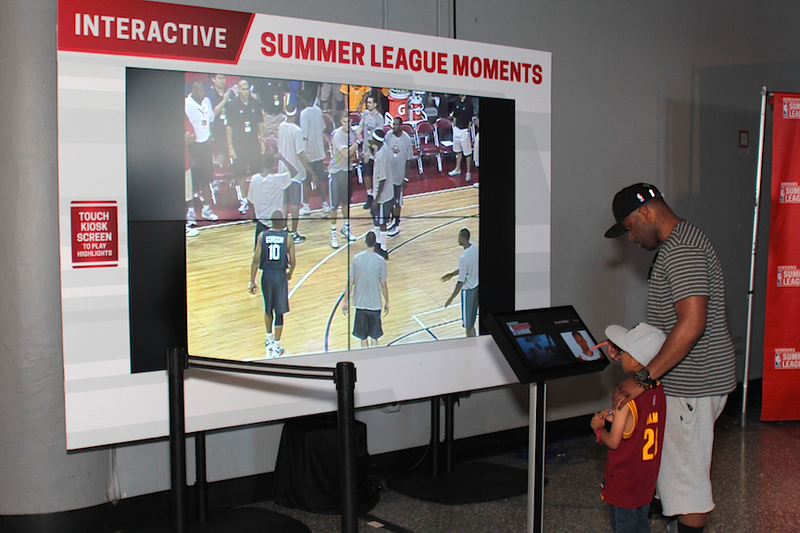 Users were able to walk up to the kiosk remote, select a player and see their highlight reel. “Each day there was a new icon to click on for the day’s best highlights. If an attendee missed a day or two they could go back and watch the highlights on the big video wall.” The hard-coded system was developed solely by EMBED DIGITAL. 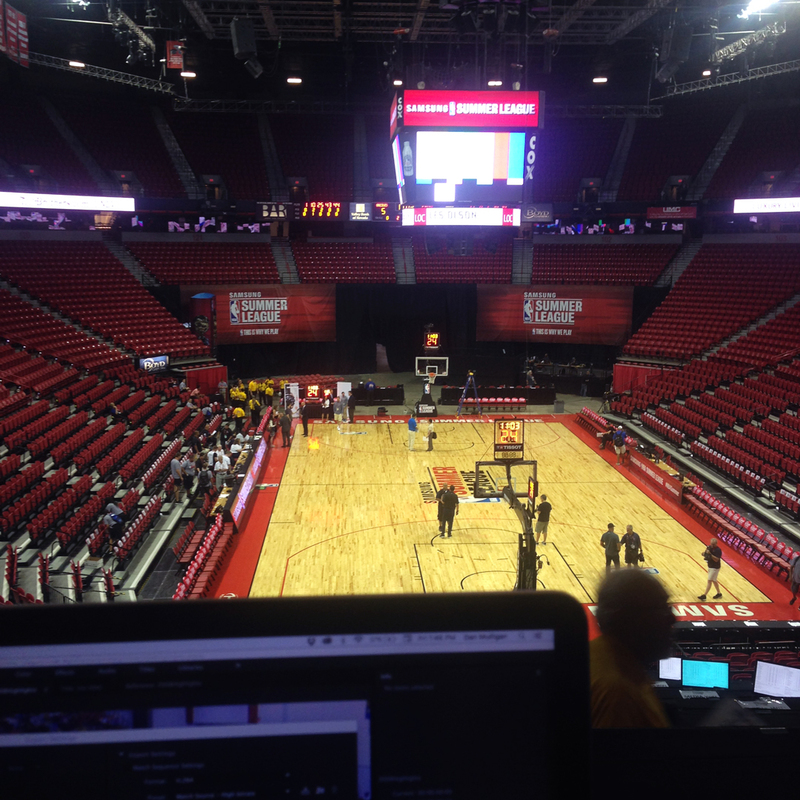 The Thomas Mack Center has approximately 50 permanently-installed screens that are generally managed from a control room. EMBED DIGITAL took the content up a notch by plugging into the backbone of the system to manage screen content, which was made up of social fan photos as well as ad space for brands like Samsung and Gatorade. A ticker also showed current games in play and upcoming events. Two truss systems were installed in the walkway. Each of the 20′ by 12′ frames included four Samsung DM screens. 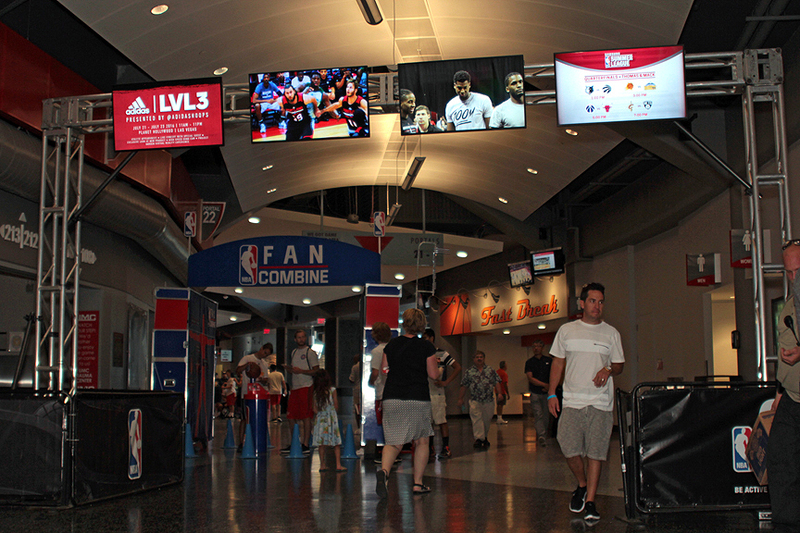 North and South systems had the same content which was made up of more fan photos, highlights, game schedules, branding for the NBA and event partners, and offered additional ad space. “This was a catch all for things we wanted to show attendees,” said Mike. 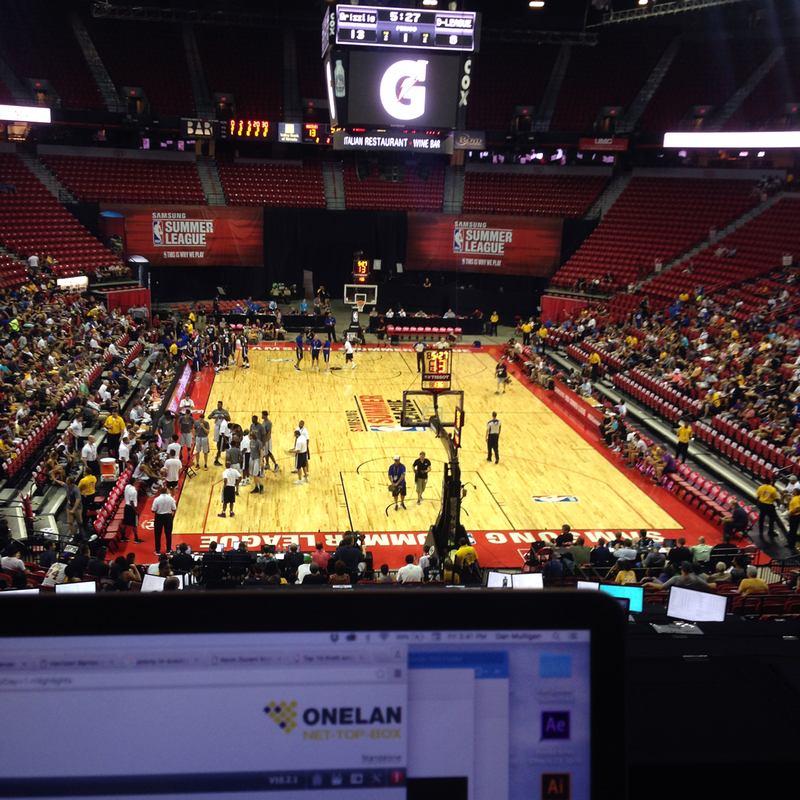 EMBED DIGITAL is a leader in cloud-based content and has worked closely with the NBA Summer League to create continued engagement with fans while the players are off the court. As a turnkey solution provider, the Digital Marketing partner acts as a single contact for these digital signage deployments. 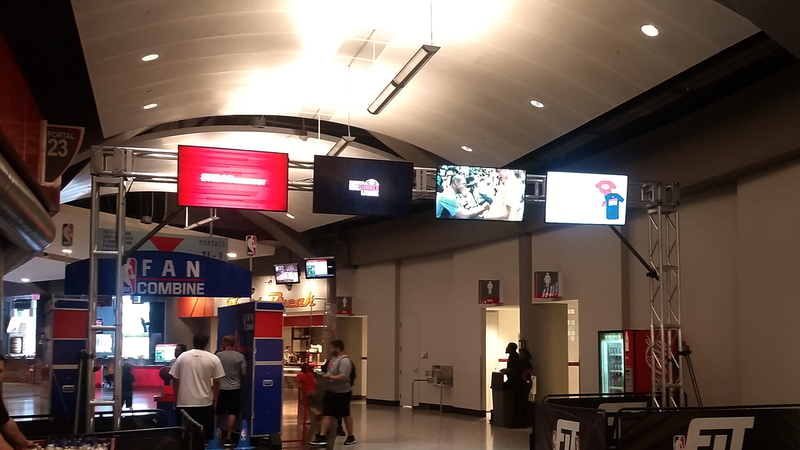 The same video wall, kiosk remote, truss systems and content management systems were used at the Adidas Uprising Summer Championships. Sports venues and brand managers in pro sports have taken greater interest in the fan experience over the past decade. Director of Media and Brand Development for the Dallas Cowboys, Craig Zurek, recently attended the Interactive Customer Experience Summit to identify customer experience technologies that may be used to increase fan experiences and interaction. Zurek, like many other leaders in pro sports, relies on the ability to transform the spectator experience through digital content and interactions. “What I liked most about the summit was the fact that it took the digital experience and crystallized how it can best tie into the customer experience.” The AT&T Stadium, previously known as the Dallas Cowboys Stadium, was a featured venue on the Summit’s Interactive Customer Experience Tour. 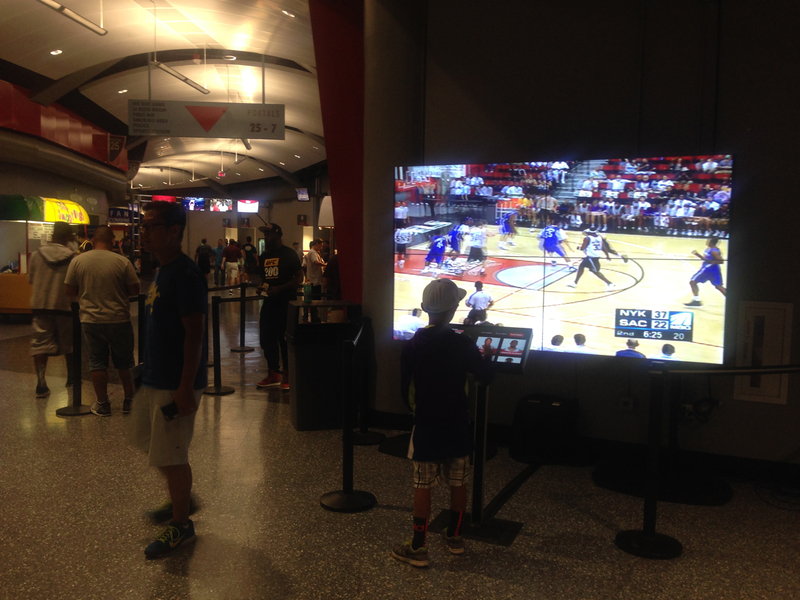 Sports venues are implementing many of the same digital, interactive and immersive technologies seen in retail deployments, just as we have seen at the NBA’s tournament-style series this summer—easily managed content, interactive touch displays and digitally-accessed information. Pro sports events provide something other than what is seen on a screen or else fans would watch the game from the convenience of their homes. Over the last decade, the quality of home television picture has led to a decline in ticket sales across many professional sporting events including the NBA. “We in the sports business don’t sell the game, we sell unique, emotional experience. We are not in the business of selling basketball,” once said Mark Cuban, owner of the NBA’s Dallas Mavericks. Sporting events are seen as a way of developing a game that people can participate in rather than spectate. 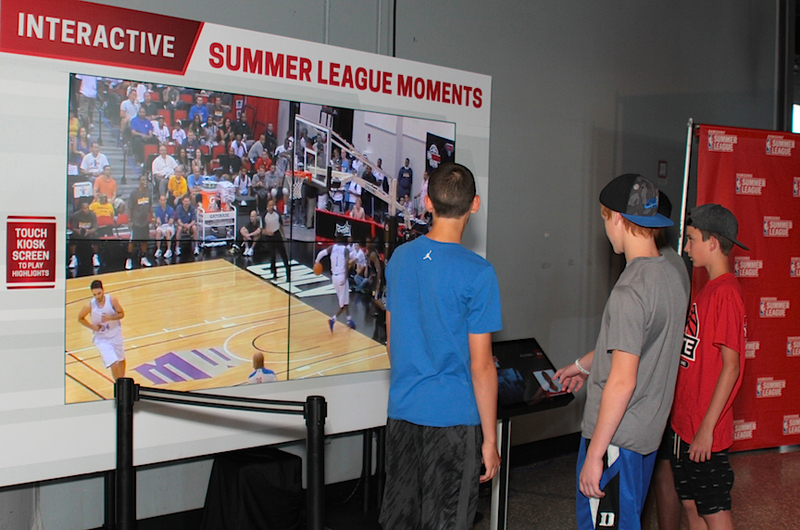 Interactive experiences, as those provided by EMBED DIGITAL at the NBA Samsung Summer League and Adidas Uprising Summer Championship, are transforming fan engagement and experiences by giving onlookers on-demand access to information and creating emotional stimulation throughout the game. Download the white paper from Digital Signage Today!